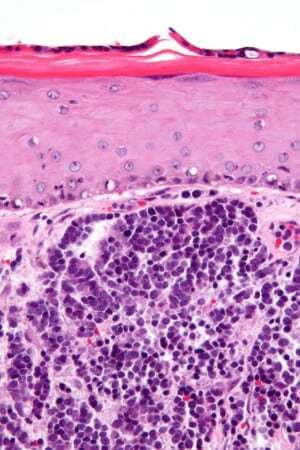 What are the Stages of Merkel Cell Carcinoma? After Merkel cell carcinoma has been diagnosed, tests are done to find out if cancer cells have spread to other parts of the body. The process used to find out if cancer has spread to other parts of the body is calledstaging. The information gathered from the staging process determines the stage of the disease. It is important to know the stage in order to plan treatment. CT scan (CAT scan): A procedure that makes a series of detailed pictures of areas inside the body, taken from different angles. The pictures are made by a computer linked to an x-ray machine. A dye may be injected into a vein or swallowed to help theorgans or tissues show up more clearly. A CT scan of the chest and abdomen may be used to check for primary small cell lung cancer, or to find Merkel cell carcinoma that has spread. A CT scan of the head and neck may also be used to find Merkel cell carcinoma that has spread to the lymph nodes. This procedure is also called computed tomography, computerized tomography, or computerized axial tomography. PET scan (positron emission tomography scan): A procedure to find malignanttumor cells in the body. A small amount of radioactive glucose (sugar) is injected into a vein. The PET scanner rotates around the body and makes a picture of where glucose is being used in the body. Malignant tumor cells show up brighter in the picture because they are more active and take up more glucose than normal cells do. Lymph node biopsy : There are two main types of lymph node biopsy used to stage Merkel cell carcinoma. Sentinel lymph node biopsy : The removal of the sentinel lymph node duringsurgery. The sentinel lymph node is the first lymph node to receive lymphatic drainage from a tumor. It is the first lymph node the cancer is likely to spread to from the tumor. A radioactive substance and/or blue dye is injected near the tumor. The substance or dye flows through the lymph ducts to the lymph nodes. The first lymph node to receive the substance or dye is removed. A pathologistviews the tissue under a microscope to look for cancer cells. If cancer cells are not found, it may not be necessary to remove more lymph nodes. Lymph node dissection : A surgical procedure in which the lymph nodes are removed and a sample of tissue is checked under a microscope for signs of cancer. For a regional lymph node dissection, some of the lymph nodes in the tumor area are removed. For a radical lymph node dissection, most or all of the lymph nodes in the tumor area are removed. This procedure is also called lymphadenectomy. The metastatic tumor is the same type of cancer as the primary tumor. For example, if Merkel cell carcinoma spreads to the liver, the cancer cells in the liver are actually cancerous Merkel cells. The disease is metastatic Merkel cell carcinoma, not liver cancer. In stage 0, the tumor is a group of abnormal cells that remain in the place where they first formed and have not spread. 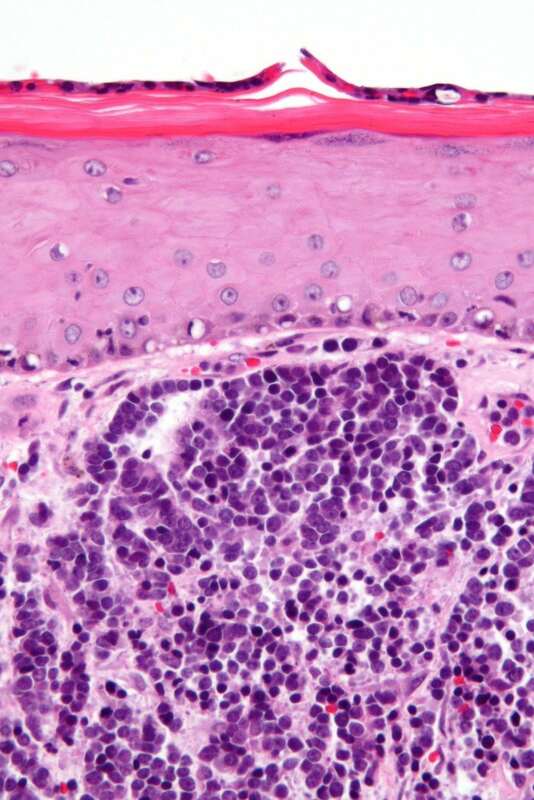 These abnormal cells may become cancer and spread tolymph nodes or distant parts of the body. In stage IIIA, the tumor may be any size and may have spread to nearby bone, muscle,connective tissue, or cartilage. Cancer is found in the lymph nodes when they are checked under a microscope. Farther away from the center of the body than the primary tumor is. 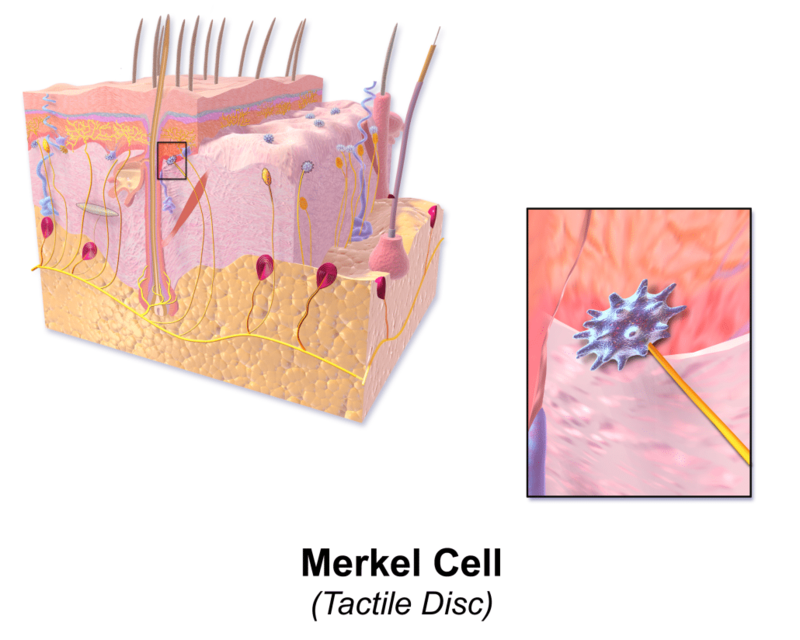 Treatment Options for Merkel Cell Carcinoma What is Merkel Cell Carcinoma?